Over 14,000 VMEbus modules in service, serving Military, Industrial & Commercial applications in all corners of the globe. Supplying a full range of module versions to complement varying customer requirements that are supplied with True COTS availability. Military 883 VMEbus modules are provided with conduction cooled thermal overlay, greatly improving capability to withstand shock & vibration. 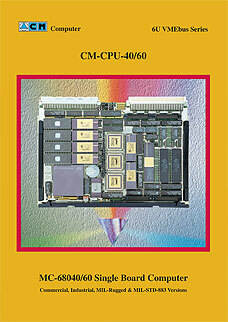 CM-CPU-40/60 is a general purpose 32 bit computer that implements classic DIL packages. Supplied with extensive BSP software. 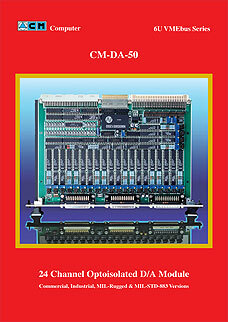 CM-DA-40 & CM-DA-50 are general purpose Digital-to-Analog boards for applications requiring special voltages or wide variations in channel ranges. 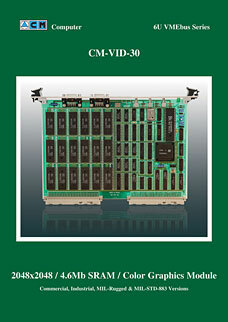 CM-VID-30 is a Color Graphic board built on a 16bit TS-68483 dedicated processor. 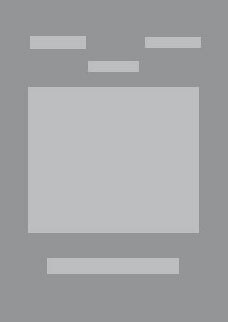 Supported resolutions up to 2048x2048. 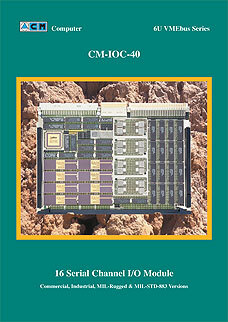 CM-MEM-40 is a 32 bit Memory Expansion board with low heat CMOS technology for integrated applications. Supports FLASH, SRAM or EPROM. 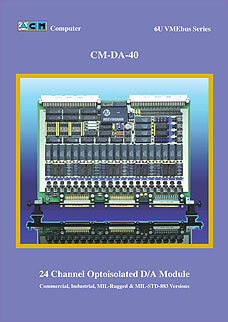 CM-AD-45 is a 32 channel A/D board. On-board auto-conversion circuitry performs all tasks relative to multiplexing, sampling & converting of analog input signals. 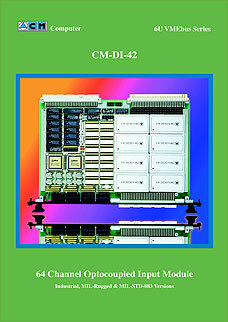 CM-DI-40 optocoupled 64 channel input board with voltage stage per channel. 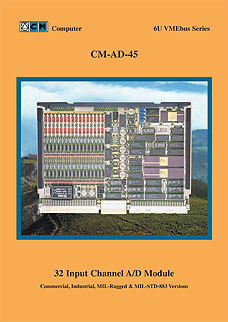 CM-DI-42 is a 64 channel, non externally powered, optocoupled input board. 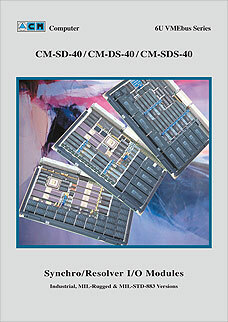 CM-SDS-40 is a Synchro / Resolver board with 4 input + 4 output channels. Supporting S/R voltage ranges & incorporating auto-conversion circuitry. 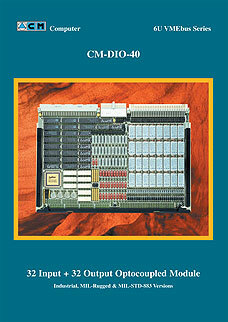 CM-SD-40 is a 16 channel Synchro / Resolver input board. Supporting common S/R voltage ranges & incorporating auto-conversion circuitry. CM-DS-40 Synchro/Resolver 8 channel I/O board that supports common S/R voltage ranges & incorporates auto-conversion circuitry. CM-DIO-40 is a 32 input + 32 output discrete board featuring overvoltage protection; galvanic isolation, rectifier & filter to support a range of AC/DC voltages. 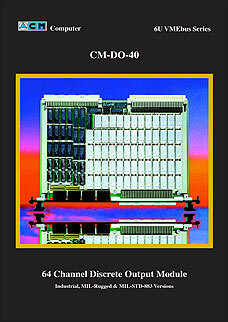 CM-DO-40 discrete output board with 64 channels. Channel outputs support; relay, optocoupler, photo-MOS, etc. SSR versions offer isolated outputs (>1000V). 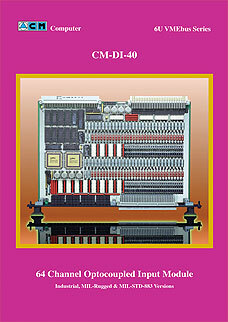 CM-IOC-40 is a universal 16 serial channel board. Based on the SCC Z-8530/85230 with up to 20 MHz & communications up to 5 Mbs.